If you are interested in becoming a truck driver, chances are you will be asked to start out over-the-road (OTR). OTR trucking requires spending multiple days and nights away from home on trips. It could mean traveling to different regions, depending on the length of haul, and the customers your company serves. 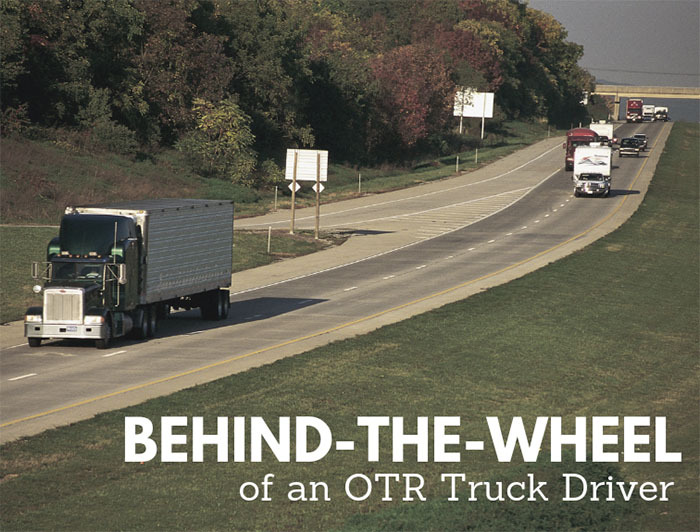 Here is what may occur in the typical day for an OTR driver. Wake up to the sound of your alarm in the sleeper in the cab of your truck. Your mattress will be approximately the size of a twin mattress—about 3′ wide by 6′ 1/2″ long. Most over the road drivers park at truck stops or rest areas for easy access to restrooms, showers, food, and coffee. After waking up you’ll head inside for a morning routine. During breakfast is a great time to plan your day. After completing a trip plan and breakfast be sure to use the restroom. The shipper may not have a place for drivers. Do a walk around and check of the truck, fuel up if you are supposed to, and head for the shipper. Arrive at the shipper early, but not too early. You don’t want to start your clock too soon. Back into the dock and receive the load. For OTR drivers this can take a while, so this may be a good time to read a book, chat with friends, check-in with dispatch, or watch a movie. After receiving the load, hit the road. Try to keep your stops as infrequent as possible and keep the truck moving. This is where OTR drivers make their money. A single trip may have several hundred or over a thousand miles and getting as many miles in a day as possible is great for the bank account. Find a radio station, podcast, book on tape, ball game or some other form of entertainment that allows you to stay attentive to the road. Stop for food and a rest break and then keep going. If you have a same day load and unload you will arrive at the receiver, unload, and then head for the truck stop or rest area. If you have a full day, or multiple days, between getting loaded and delivering you will shut down with the load. Be sure you shut down in a secure lot. You’ll use the evening time to rest and recover for the next day. Have dinner, socialize with others, get some exercise, and rest for another day of trucking. The OTR lifestyle can be an adjustment, but it is a great way to make money, travel, and can be an enjoyable shift. If you want more information on how to become an OTR driver contact us today. Georgia Driving Academy is ready to help you get started with CDL training!